‘The Birth of Creation’ is a large, dualistic painting split vertically down the centre of the canvas by contrasting colours and biomorphic forms of hot and cold. 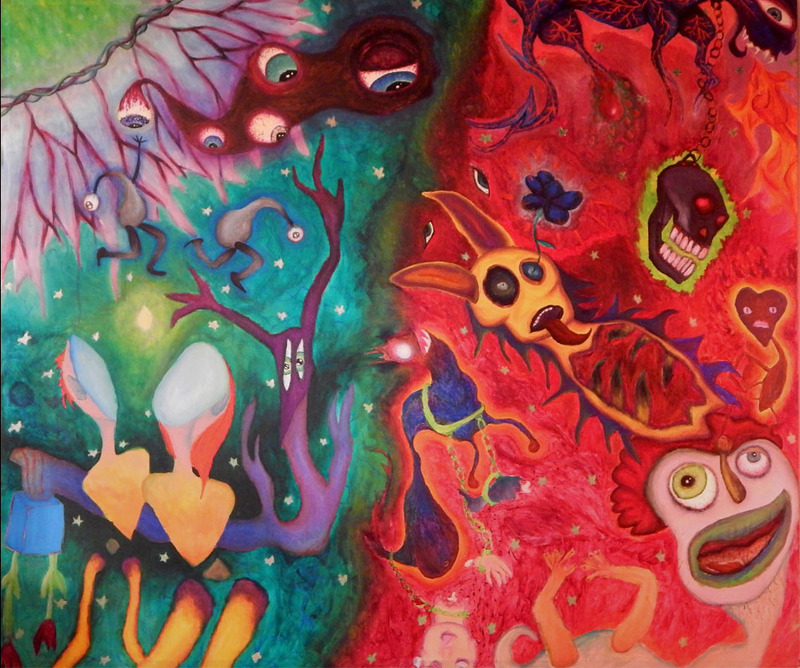 It is an ‘automatic’ painting depicting the shadow aspect of the psyche and those ‘nameless things’ outside the light of consciousness that may be positive or negative. ‘The Birth of Creation’ is one of Kaeti Wietzel’s ‘automatic’ paintings that was created using the Surrealist method of psychic ‘automatism’. ‘Automatism’ is technique of subconscious drawing in which the artist allows their unconscious mind to take control. Psychic ‘automatism’ is inherently antinomian in practice as it is a method to escape from cultural, intellectual and historical constraints and unlock the basic creativity supposedly lodged deep within the artist’s personality. It has been also practised for centuries by mediums and practitioners of the psychic arts. See also: ‘Pig God’ (2006) by Kaeti Wietzel.